“All politics is local,” stated oft-quoted Tip O’Neill, legendary former Speaker of the U.S. House of Representatives. 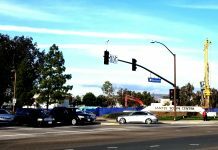 The San Diego County Board of Education’s San Diego County Committee on School District Organization lived out that maxim on March 17, vacating their usual Linda Vista meeting spaces to hold a local public meeting for East County citizens in the La Mesa-Spring Valley School District Board Room in La Mesa. “All politics is local,” stated oft-quoted Tip O’Neill, legendary former Speaker of the U.S. House of Representatives. 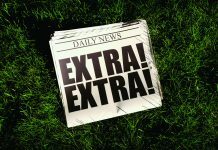 The San Diego County Board of Education’s San Diego County Committee on School District Organization lived out that maxim on March 17, vacating their usual Linda Vista meeting spaces to hold a local public meeting for East County citizens in the La Mesa-Spring Valley School District Board Room in La Mesa. The public meeting was the first of five scheduled for presenting information to the people and taking their comments about the rapidly advancing proposal to carve up the Grossmont Union High School District elections for Governing Board trustees into by-trustee areas. Committee board members expressed important “concerns” over the “lack of public input,” the “vested interests,” and the presence of “no community voice here” but “mostly staff.” One detailed concern mentioned was over only two parents being at the meeting, and whether schools had sufficiently informed parents about the meetings, including whether robo-calls had been made. About 30 attendees were present at the public meeting. County education board members are authorized to sit as the San Diego County Committee on School District Organization, under which auspices the meeting was formally convened. Blue cards were available for those who wished to sign up to deliver public comments. Attendees could provide written comments about the election system change on pink cards, for the committee to review. Four future meetings in the series will follow the same procedures. Elections for the five GUHSD trustee board seats are currently conducted at large, for voters across the entire GUHSD region. The proposed election changes come in two parts. 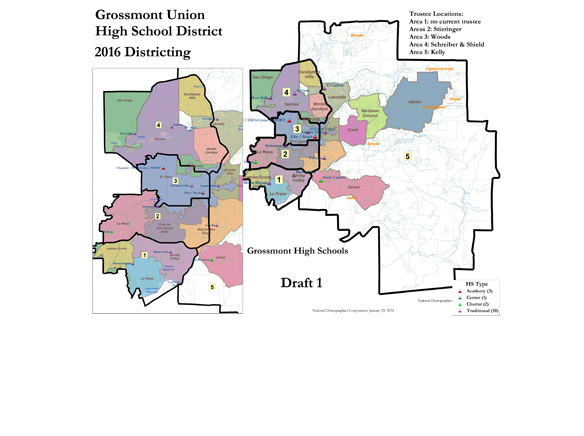 The basic question is whether to split the district’s trustee elections into five by-area contests, and then whether to approve demographer-constructed specific boundary lines for five new subsections of GUHSD immediately for the November 8, 2016 elections, without prior approval of voters. Voter disenfranchisement is at the heart of the matter, on several different levels. 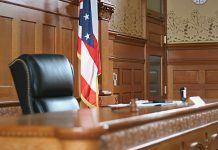 The proposed election changes arose in response to a threatened possible lawsuit, claiming violation of the California Voting Rights Act. The CVRA was legislation with the stated attempt of ensuring that election districts are drawn so that “protected classes” have an adequate chance of electing one of its members to office. A passage in GUHSD Governing Board Resolution 2016-21 states, “On or about November 18, 2015, the District received a letter contending that the District’s at-large electoral system violates the Act, and threatening litigation if the District declined to adopt by-trustee area elections for use in November 2016 and thereafter.” The resolution further notes “the letter was not accompanied by any evidence” and “in fact contained demonstrably false statements about the demographics of the District.” Nonetheless, to foreclose involvement in that possible litigation, the GUHSD Governing Board at its December meeting unanimously approved setting in motion the process to transition from at-large to by-trustee-area elections. The March 17 public meeting in La Mesa was the first that the County Committee held for the local community in the ensuing chain of events. Lora L. Duzyk, the county education office’s assistant superintendent in the Business Services Division, led off the informational presentation, outlining the schedule and guidelines for the five public meetings. Duzyk told the audience that the Committee is expected to vote at the regular board meeting on April 13, on the proposed GUHSD election system changes. The first Committee vote is set to be on whether to keep at-large voting or split up the district into by-trustee-area elections. Disapproval would end the process. Approval would allow a second committee vote, on whether to immediately adopt the specific demographer-drawn area lines breaking up GUHSD trustee elections into five separate contests, by transmitting a “waiver of election” request to California’s State Board of Education. These actions, if approved by the County Committee and then subsequently by the state board, would bypass GUHSD voters entirely, without local voters being given the chance to decide on the election changes beforehand. Those changes would be imposed on the November 8, 2016, election. Ralf Swenson, GUHSD superintendent, next took the meeting floor. Swenson spoke of “changing times for East County” and its “changing demographics.” He relayed that the region is experiencing economic distress, with 61 percent of students qualifying for meal assistance money. Swenson then introduced a videotaped speech from a demographer who works for the company National Demographics Corporation. In the video, the demographer apologized for not making himself available to take questions from the public and described three draft redistricting maps his company had prepared based on 2010 census figures, the first by city and community boundaries, the second by high school attendance zones, and the third by elementary schools that “feed” into GUHSD. He discussed the relevance of Draft 1 (by cities) creating a so-called “majority-minority district.” Draft 1’s Area 1 has 52 percent of its voting citizens defined as “a minority” by adding together its citizen voting population numbers of Asian-Americans, African-Americans and Hispanic-Americans, which allows treating that amalgamated group as “a minority” and “protected class” for purposes of the CVRA. Area 1 has its boundary lines surrounding Lemon Grove, Spring Valley and La Presa, and no current GUHSD trustee lives there. The NDC demographer then explained his field’s term-of-art “pairing,” redistricting parlance that refers to drawing new election district lines that force currently sitting officeholders into the same district, setting up an election contest between or among incumbents. He noted that Draft 1’s Area 4 is drawn to include the residences of two current GUHSD trustees, Governing Board President Robert Shield and Trustee Priscilla Schreiber. He dubbed as “funny fingers” redrawn lines that would place Shield and Schreiber into different election areas. One offshoot aspect of the proposed election changes would be ouster of Schreiber from board service in favor of Shield, who is not up for reelection until 2018. Schreiber, known on the trustee board as a strong advocate for a high school in Alpine, would be treated as unable to run again until 2018. Twelve people spoke during the public comments section of the meeting, including two current GUHSD trustees. Seven identified themselves as school employees or representatives of school-affiliated organizations. The Mt. Miguel High School principal was followed by one of her students. All of these speakers supported the by-trustee-area changes. That raised a significant point. Ben Kalasho, founder and president of the San Diego East County Chaldean American Chamber of Commerce, said he found the GUHSD Governing Board to be “very politicized,” and he observed that local Chaldean-Americans had been “overlooked” during the redistricting process. He assessed that GUHSD’s Chaldean-Americans would be divided into “at least three” different areas under the redistricting lines. He imparted that Schreiber, alone among the GUHSD Governing Board, had “reached out” to represent Middle-Eastern-Americans in the district. He stated a preference for slowing the process to redraw new trustee area boundary lines so as not to negatively impact Chaldean-Americans. Similarly, a spokeswoman for the Southern California American Indian Resource Center indicated that East County’s Native-American high schoolers would be separated into three different areas under the Draft 1 redistricting lines. She further said that local Native-Americans had not been involved in the process. GUHSD Trustee Jim Kelly spoke in favor of the by-area election changes. He was very critical of opponents. Questions posed to staffers included why the election changes were not to go before the voters first before imposition, but a “waiver from election” was central in the ongoing process, and whether, if as is quite probable Alpine secedes from GUHSD to spend Alpine education dollars on building a new high school, new redistricting boundary lines would very shortly need to be redrawn. The staffer answers were troubling and conflicting. The “waiver” was said to be justified to save money from “expensive elections,” while a likely Alpine withdrawal from GUHSD was predicted to incur added expense from the need for yet again hiring demographers and lawyers to oversee and defend the latest redistricting process and lines. East County Regional Education Center, 924 East Main Street, El Cajon, CA 92021. Joan MacQueen Middle School Library, 2001 Tavern Road, Alpine, CA 91901. Jamul Intermediate School Library, 14545 Lyons Valley Road, Jamul, CA 91935. Lakeside Union School District Administration Center, 12335 Woodside Avenue, Lakeside, CA 92040.